Charles Duhigg is a pro when it comes to inspiring motivation and helping people achieve their goals one step at a time. After all, he wrote The Power Of Habit a few years ago. 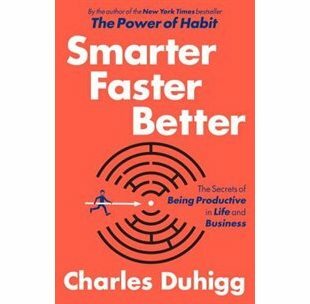 Smarter, Faster, Better is a book about how to recognize the choices that fuel true productivity. It all boils down to eight things. The first being motivation. “The need for control is a biological imperative” a study found. When people believe they are in control, they tend to work harder and push themselves more. Motivation though is not that easy. Occasionally, to really self-motivate we need something more. When everyone is jousting for leadership and critiquing each other’s ideas, it makes for a better team environment than if everyone is supportive and enthusiastic. Although one may hypothesize that good teams have more decisive leaders, research found that this was not the case. In fact, researchers concluded that good teams had succeeded not because of innate qualities of team members but because of how they treated one another. In fact, the most successful teams had norms that caused everyone to mesh particularly well. Charles Duhigg says that when groups get together, it’s important to give control to others. And, team leaders need to know how to give people control. Evidence strongly suggests that group norms play a critical role in shaping the emotional experience of a team. An interesting occurrence from one study that measured the impact of enthusiasm vs. loyalty in teams, stated that enthusiastic norms made teams better than loyalty norms. The science of productivity is always an intriguing topic for the modern age. The book suggests that driving ourselves harder, or pushing ourselves to work faster, will not necessarily achieve greater productivity. Rather, it's how we think, identify goals, construct teams and make decisions, that has the most impact. It's not just about acting differently, it's about envisioning the world and the choices in profoundly different ways. Smarter, Faster, Better is published by Doubleday Canada.